Ashburton Crane Hire is a company committed and built on providing you with an exceptional, safe and reliable lift and shift crane service 24/7 in Perth. In 2005 Guy Black founded Ashburton Crane Hire in Perth at High Wycombe, eastern suburb of Perth Western Australia near Perth airport to provide an exceptional Crane and Rigging service Perth wide. Ashburton Crane Hire operates a modern fleet of Liebherr all-terrain cranes, Franna pick and carry cranes and Grove rough terrain cranes wet or dry hire. We also operate a late model Western Star truck with custom made counterweight trailers and Isuzu NPR300 rigging trucks. Ashburton Crane Hire focuses on employing experienced management, crane operators and experienced riggers for hire in Perth with an exceptional attitude to ensure we meet our client’s expectations in a safe and professional manner. We like to take our time choosing the right people while investing in them to uphold excellence in everything we do at Ashburton Crane Hire. 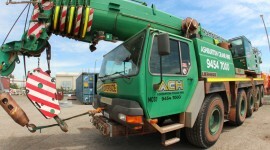 WHY CHOOSE ASHBURTON CRANE HIRE IN PERTH? West Australian family owned company providing crane hire wet or dry for any project “Australia” wide. 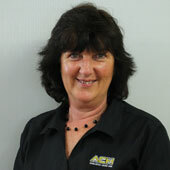 Ashburton Crane Hire is a West Australian family owned company based in High Wycombe in Perth. It was stablished in 2005 with the purchase of one new 20t Franna crane. Due to client demand, Ashburton Crane Hire has expanded its crane service fleet to 3 x 100t Liebherr all-terrain cranes, 1 x 70t Grove rough terrain, 2 x 25t Franna pick and carry cranes and a 20t Franna pick and carry cranes. Guy Black – Managing Director has over 26 years crane industry experience in Perth and the north west of Western Australia. Management team is hand-picked for their professional expertise and commitment to crane hire giving us a competitive edge over our rivals. Regular crane maintenance including non-destructive testing (NDT) of metal welds and repairs before metal fatigue causes catastrophic crane failures. We also have semi-trailers, Isuzu rigging trucks and specialised lifting equipment. Taxi crane hire throughout Perth and the surrounding areas is our specialty and we can also provide wet or dry for any project “Australia” wide. 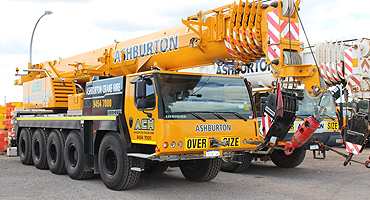 Ashburtong Crane Hire in Perth operates a diverse fleet of modern mobile cranes with which to support you and your business. We have 10 cranes in our fleet ranging from 20t pick and carry to 100t all-terrain cranes, we have access to all-terrain cranes up to 750t hydraulic cranes in Perth or pin jib cranes in Perth if required. 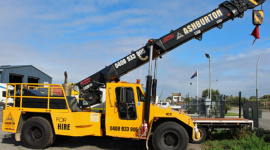 Ashburton Crane Hire operate an around the clock service 7 days a week. Let us know what you require and when because we want to attend to every detail of your Perth crane lift project. Over the past 10 years, Ashburton Crane Hire has been involved in large scale construction projects across Perth and Western Australia. We supply wet and dry crane hire services to Blue Chip clientele. Hillgrove Gold Mine expansion. Armidale New South Wales. What is the item to be lifted and how much does it weigh? How far does the crane need to reach? What date and time do I need it? Do I have a licensed Rigger/Dogman?